In spite of responses like these, the Lord’s Supper is a solid component of Christianity — both historically and biblically. Most believers would agree that if a congregation decided that Communion is no longer relevant, they could not base their discontinuation of it on the teaching of Scripture. In addition to the Lord’s Supper, Paul describes another symbolic practice in the very same chapter. Just prior to rebuking the Corinthians about how they mishandled Communion, he praised them for following other important practices. Specifically, Paul spoke of men uncovering their heads when praying, and women covering their heads while praying. 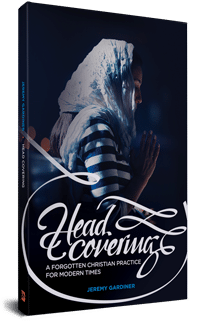 And this was much more than a passing comment: Paul’s detailed explanation of the headcovering practice contains the exact same three components as his teaching on the Lord’s Supper. Specifically, he (1) presents a new symbolic practice, (2) gives a uniquely Christian explanation for it, and (3) provides an unqualified command for its usage during times of prayer. So, in this passage of Scripture we see two unique symbolic practices — both taught by the same person, to the same audience, in the same chapter, with the same three components. Perhaps this is more than just a coincidence. 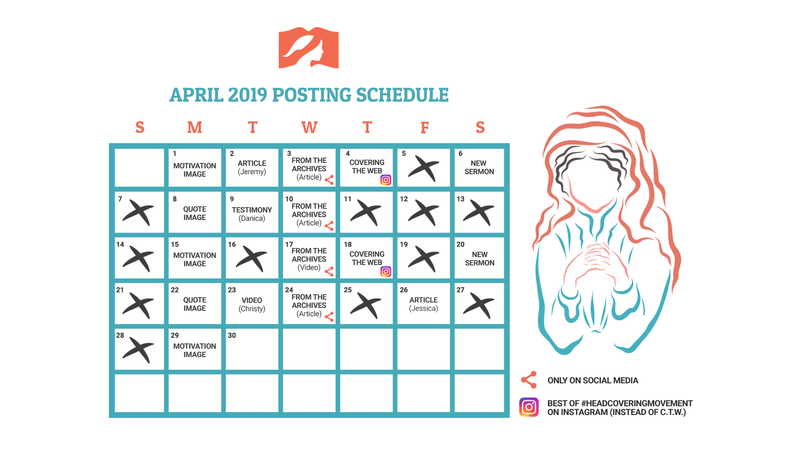 Indeed, as with the Lord’s Supper, Church history testifies that believers around the world have maintained the symbolic practice of headcovering for the majority of the last 2000 years. So, what do we make of this passage on headcovering? Is Paul simply trying to keep a worldly Corinthian church in step with the fashions of the surrounding pagan society? On the contrary, the passage itself indicates that this headcovering practice (like Communion) is uniquely Christian — and Christianly meaningful. And yet — ironically — that idea of “keeping in step with pagan society” is exactly how many people nowadays interpret this section of Paul’s teaching. Obviously, over the last several generations, the practice of headcovering has suffered a different fate than that of Communion. Mary Kassian (professor at Southern Baptist Seminary) writes, “It is only in the past three or four decades that its observance has slipped away — particularly in Western society.”1) Mary Kassian, Women, Creation and the Fall (Crossway Books, 1990), 179. But like Communion, its discontinuation cannot be based on Scripture. Rather (as we’ll soon see), the decline of the headcovering practice is heavily due to the influence of modern Western society. The paradoxical result is that many folks nowadays (themselves influenced by modern Western society) interpret Scripture’s headcovering instructions as being influenced primarily by ancient First Century society. While Paul himself makes no such connection to First Century society, the argument of “societal influence” does actually work rather well in reverse. In other words, while historic headcovering practice cannot be explained in terms of societal influences, modern headcovering non-practice can easily be explained in terms of societal influences. When reading Paul’s instructions about headcovering, many modern readers automatically make this assumption: in First Century Corinth, it must have been normal for women to wear a headcovering while in public. In other words: “Christian female headcovering was based on society’s standards.” While a societal influence was not actually the case historically, it is indeed the case in modern times.2) At the time of Paul’s writing, the city of Corinth was a Roman colony. First Century Roman society provided no rule that women must wear a headcovering in public. For more details on this, please see this article, as well as the section titled “Headcoverings In First Century Culture,” found on page 10 in the full-length version of Covered Glory. 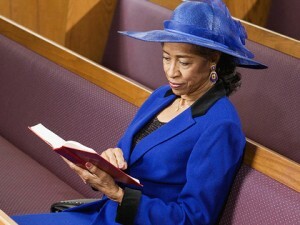 For example, Christianity Today (September 2013) pinpointed one specific cultural cause for the non-use of headcoverings during Christian worship today: “The practice of head covering continued even up to the early 20th century… [But] the biblical practice had become merely a tradition, so when hats fell out of style, the practice was dropped in Christian churches.”3) Luma Simms, Uncovering the Head Covering Debate (Christianity Today Online, September 2013). During that transition time, a number of news outlets reported4) Examples of the “great newspaper controversy” can be found in the following: “Hatless Women in Church” in The New York Times (August 20, 1903); “Hatless Irreverences” in The London Mail (September 22, 1904), 8; Douglas Sheilds, “Keeping Hatless Women Out of Church” in The World To-day, Volume 9 (Current Encyclopedia Company, 1905), 1348; “Hatless Women in Church” in The Bystander (August 30, 1905), 445;The Washington Post (September 3, 1905); 51; The Wichita Daily Eagle (September 6, 1905), 4; “Hatless Women in Church” in The Press (October 28, 1905); 7; “A New Issue” in the Boston Evening Transcript (November 29, 1905), 9. that the “unbonnetted ones” believed that “it is physically far more comfortable [to be uncovered] than otherwise” and noted that there was a growing sentiment that “the Church should move with the times. Further, headcoverings in modern Western culture are often associated with Islam. They have therefore become much less appealing within mainstream Christianity. Note, however, that the Christian use of headcoverings significantly predates the Islamic use. Moreover, the use of headcoverings is not actually commanded in the Koran, and the popularity of the modern hijab is only a relatively recent phenomenon (with its style reportedly inspired by historic paintings of Christian women).5) Facing History: A Brief History of the Veil in Islam, NPR: The Case Against Wearing Hijab To Support Muslim Women, New York Post: This Is Not Islam, Oxford Dictionary of Islam: Hijab, A Quiet Revolution, Harvard Magazine: The Veil’s Revival. And so again, the issue of societal influence relates more to today’s Christians than to First Century believers. Yet this same line of reasoning does become valid when applied to modern times. In other words, the non-use of headcoverings today is often based on modern culture’s response to gender roles. As one Bible commentator stated, “This is one of several passages… that have raised the ire of some women, particularly in the ‘Women’s Liberation’ movement.”7) William F. Orr & James Arthur Walther, The Anchor Bible (Vol. 32): 1 Corinthians (Garden City, NY: Doubleday, 1976), 262. In fact, the feminist National Organization for Women easily recognized the connection between headcoverings and gender roles. In the late 1960’s, they asked women to remove their headcoverings as part of a “national unveiling” event, at which point the coverings would be sent to the organization in order to be “publicly burned” in protest. On gender-related issues, today’s society has “progressed” much further than the 1960’s. Modern Western culture often has an unbiblical view of gender distinctions, and therefore naturally opposes the meaning behind the Christian use of headcoverings. Similarly, there is a culture-based dynamic at play in regards to Paul’s instructions for men. Some commentators assume that Corinthian society dictated that males were to have their heads uncovered during worship. Historically, the case was the exact opposite.8) In First Century Corinth (a Roman colony), men normally covered their heads during worship. 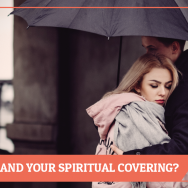 For additional information, please see the article “Is Headcovering Cultural?,” as well as Appendix C of the full-length version of Covered Glory And yet a culture-based philosophy does well in explaining the practice of our present day. Many Christian men today take off their hat while praying as if it were merely a societal rule of respect (similar to taking off their hats when entering a building, or while the National Anthem is playing), rather than a practice rooted in Scripture itself. Culture vs. Bible: Now What? Within hermeneutics (the study of biblical interpretation), the issue of culture can play into two specific problems. Our first problem is when we assume that all biblical instruction is limited to its historical audience, or that all biblical practices are limited to the original audience’s culture. These assumptions are patently untrue. The Bible does still speak to us today, and it speaks with the authority of the Almighty God. The second problem is very practical: some parts of today’s Christian society are influenced more by modern culture than by Scripture. The dangerous result is that we call Scriptural commands “relative” while considering our society’s standards to be more relevant. If the Bible’s instructions are “human words based only on ancient culture” — and if we find that today’s norms just feel more acceptable — then we have turned a deaf ear to God’s living Word. We are doing the exact opposite of the Thessalonian believers, to whom Paul wrote: “For this reason we also constantly thank God, that when you received the word of God which you heard from us, you accepted it not as the word of men, but for what it really is, the word of God, which also performs its work in you who believe” (Thessalonians 2:13 NASB; see also 2 Timothy 3:16-17). The solution? We need to return to the authority of Scripture — even when that means our thinking or practice becomes counter-cultural. Fortunately for us, we’re in good company. Not only was Jesus Himself often counter-cultural, but Paul’s headcovering instructions were counter-cultural even for the Corinthian Christians themselves. 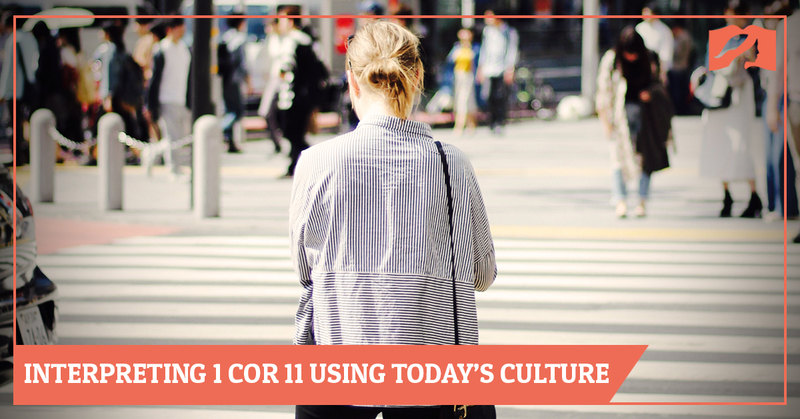 Therefore, when seeking to convince the Corinthians about the necessity of this new tradition, Paul presented the headcovering symbolism as being a standard practice among Christians (1 Corinthians 11:16). And as believers around the world today follow Paul’s timeless & inspired instructions, we have the blessing of contributing to that same unity. ↑ Mary Kassian, Women, Creation and the Fall (Crossway Books, 1990), 179. ↑ At the time of Paul’s writing, the city of Corinth was a Roman colony. First Century Roman society provided no rule that women must wear a headcovering in public. For more details on this, please see this article, as well as the section titled “Headcoverings In First Century Culture,” found on page 10 in the full-length version of Covered Glory. ↑ Luma Simms, Uncovering the Head Covering Debate (Christianity Today Online, September 2013). 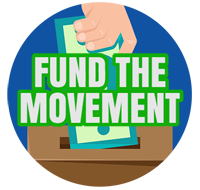 ↑ Examples of the “great newspaper controversy” can be found in the following: “Hatless Women in Church” in The New York Times (August 20, 1903); “Hatless Irreverences” in The London Mail (September 22, 1904), 8; Douglas Sheilds, “Keeping Hatless Women Out of Church” in The World To-day, Volume 9 (Current Encyclopedia Company, 1905), 1348; “Hatless Women in Church” in The Bystander (August 30, 1905), 445;The Washington Post (September 3, 1905); 51; The Wichita Daily Eagle (September 6, 1905), 4; “Hatless Women in Church” in The Press (October 28, 1905); 7; “A New Issue” in the Boston Evening Transcript (November 29, 1905), 9. ↑ Facing History: A Brief History of the Veil in Islam, NPR: The Case Against Wearing Hijab To Support Muslim Women, New York Post: This Is Not Islam, Oxford Dictionary of Islam: Hijab, A Quiet Revolution, Harvard Magazine: The Veil’s Revival. ↑ William F. Orr & James Arthur Walther, The Anchor Bible (Vol. 32): 1 Corinthians (Garden City, NY: Doubleday, 1976), 262. I needed to read this today! I was highly encouraged by it! The headcovering practice was not uniquely Christian at all, just like wearing sandals or any other garment was not uniquely Christian. If you look at sculptures/illustrations of public women from that time, they have head coverings. When I say, “illustrations from that time” I mean specifically Corinth at that time. Paul says in verse 16 that the rest of the churches elsewhere didn’t practice using headcoverings, because the culture was different outside of Corinth. 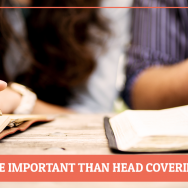 The churches of God didn’t and don’t have the custom of asking women to cover their heads. Hi Theophilus, we believe verse 16 is in favor of head covering. He is saying they have no such custom (as women praying uncovered). That is the closest antecedent from v.13.